It comes as a relief to me to know that I am not the only reader to have occasionally confused Malcolm Bradbury with David Lodge. Any such confusions were only ever momentary. Where others might have, I never conflated the two writers to create a third ‘conceptual compound’, the well-known novelist ‘Blodge’, whose books we all claim to know but cannot quite bring the titles to mind. Alongside the biographical pieces are some short stories and journalism, and the fragment of the novel which gives the collection its title. In ‘Welcome Back to the History Man’, Bradbury muses on the creation he brought into the literary world and assesses the damage that his own Frankenstein, Howard Kirk, is said to have wreaked on the academic community, particularly in the field of sociology, which, some claim, ‘has not really recovered its authority.’ Though he seems flattered to be considered a player, Bradbury considers the larger picture and the more obvious reasons for the demise of sociology. ‘The Wissenschaft File’ is the place where Bradbury kept his letters from foreign students from ‘any one of the European countries where they study contemporary literature in a decidedly energetic and theoretical sort of way.’ So convincing is it, that it might just not be a spoof. But it is. Bradbury concedes too early that it is merely an example of the type of letter he receives in his daily post. … a great novel can be simple, or difficult, but first and foremost it is not an imitation, it is a book that has its own inner voice.’ Bradbury as critic and academic was attuned to that ‘inner voice’, which in his own creative writings he was able to express. 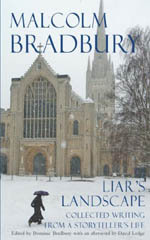 Lodge writes, Liar’s Landscape is ‘a book for readers who already know and love Bradbury’s work, and cherish every bit of it; who will be grateful that a substantial amount of his fugitive journalism has been preserved, engaged by the autobiographical memoirs, and fascinated by the unpublished stories and fragments of unfinished work-in-progress.’ Bradbury’s son, in his introduction, having explained that ‘this book evolved from clues from my father’s desk. … Assembled over time, with love and regret, I wish I could ask Malcolm Bradbury, father and writer, if this compilation feels right to him.’ Most readers familiar with Bradbury’s life and work will think it would have done.